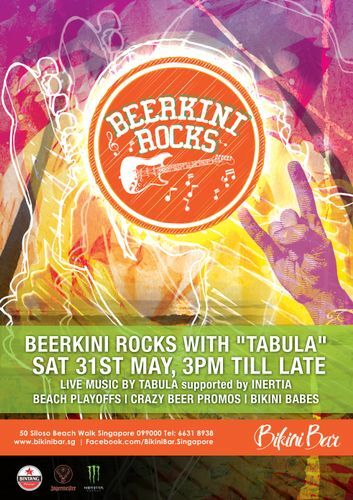 Beerkini Rocks is back to make noise, only at Bikini Bar! Bigger and louder, this quarterly event returns for the second time this year. At centre-stage will be one of Singapore's most sought after bands in the local music scene, Tabula, providing a performance of pure energy and supported by that other dynamic band, Inertia. That's not all – the party gets started even before the bands strum their guitars, with our not-to-be missed crazy drinks offers, available during Beerkini Rocks, with Jaeger Shots at only $8, Monster Bombs at $9, Buckets of Bintang at $38 and many more. Also, Bikini Babes will be challenging rock and rollers to fun and exciting games.